Some gardeners are unafraid of reaching for chemicals and some will do so only as a last resort. Regardless of your comfort level, you could be held responsible for any consequential damages that result from your failure to follow the manufacturer’s instructions printed on the container. Before resorting to chemicals, it’s essential to correctly identify the problem. If in doubt, contact your county’s Cooperative Extension office. Then, decide if you can live with the problem or if a change in your gardening habits could help. For example, overhead watering is responsible for black spot in roses—have you been watering roses from overhead rather than at the roots? A change in your behavior may solve the problem. If the problem persists, it may be time to go shopping for a solution. Start by reading the instructions for the product’s use printed on the container. Following these instructions will produce the best results. Do not simply rely on the advice of the salesperson. Remember, these instructions are a legal document that you have agreed to follow by purchasing the chemical. 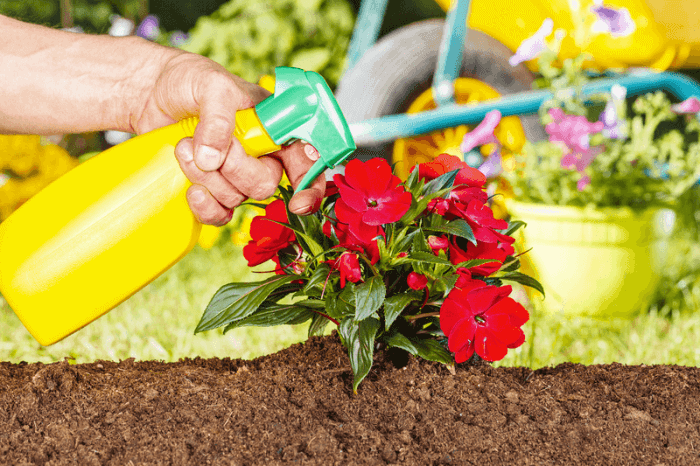 It’s up to you to ensure that this chemical can treat the problem on your plants. If the chemical is in a concentrated form, do not deviate from the mixing instructions. The companies producing these chemicals have rigorously tested them—you do not know more about these chemicals than they do. Do not buy more of the chemical than you will use and only mix what you need for a single application. The product instructions will define what type of protective clothing to wear, how to mix, store—and most importantly, how to dispose of the amount you don’t use. Excess should be taken to an appropriate disposal site, one that can handle toxic waste. Contact your county Cooperative Extension office for information as to where to dispose of unused chemicals. Use chemicals in a manner that will not harm pollinators. This includes organic compounds. Remember, some organic pesticides, fungicides, and herbicides can still be dangerous to both you and the pollinators so you must read the instructions. If you see, do not spray while pollinators are active, spraying should take place either in the early morning or at dusk. If the chemical has a bee icon, or a pollinator protection box, that tells us we shouldn’t spray any plant when it is in bloom. Here you have the option of cutting the plant back—what is sometimes referred to as cut a bouquet and then spray. For chemicals that require spraying, make sure you know how to use the sprayer, as all of them are a bit different. Do not spray on a windy day to avoid a contaminating drift. The dirty little secret with instructions on the container is that the print is small, we’re usually in a hurry to find a solution, and it makes for dull, but necessary, reading. Consequently, not everyone follows the directions. The simple truth is that if you are going to get your money’s worth from the chemical, if you are going to bring the problem under control, and if you are going to apply the chemical in a safe manner, you must read and follow the instructions. Dr. Lise Jenkins is the former producer of an award-wining, syndicated gardening radio show and podcast. She volunteers as a Master Gardener in Durham.